2015 WAS A FANTASTIC SUMMER FULL OF FUN -- THANKS TO EVERYONE FOR COMING OUT TO THE FARM!! This will give you an idea of what we created last year. We will have more of the same and also some new classes. We are excited to have our Summer schedule up-- most of June is full but scroll down for the new July postings. As always we require a deposit of at least half the class to hold your spot. Email laughingbuckfarm at gmail dot com with the classes you are wanting to register for and I will let you know the deposit and we will put your kid/kids on the list. We keep our classes small and they fill up quickly so sign up and get your deposit in quickly to avoid disappointment. There are many classes available so we are hoping that you will be able to get some fun farm time in this summer. A sweet note: Wednesday horse classes with Natalie are mostly hands on with horses so let's make sure it's the real horse lovers that sign up for these. We want to make sure the kids get the most out of their horse class with the small size and teacher focus. We greatly appreciate it. We are offering more farm classes weekly that will incorporate nature activities, garden, farm play and horse riding. 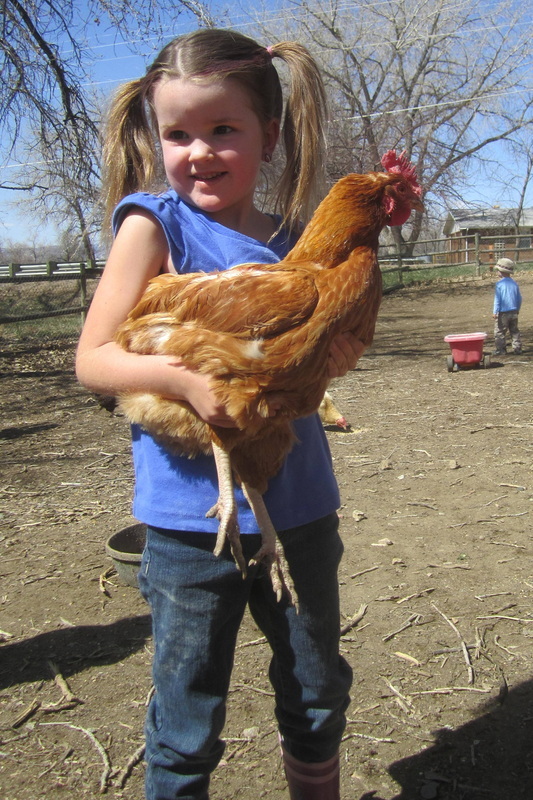 On Summer Farm Days we will explore the new children’s garden, play in the haybarn, learn about horses, chase chickens, brush the pig, milk the goat, and get a sense of what life is like on the farm. We could also have hands on nature activities and / or water fun depending on the day. Please send your child with water, lunch and a snack. Children need sturdy shoes that cover the toes when working with horses. 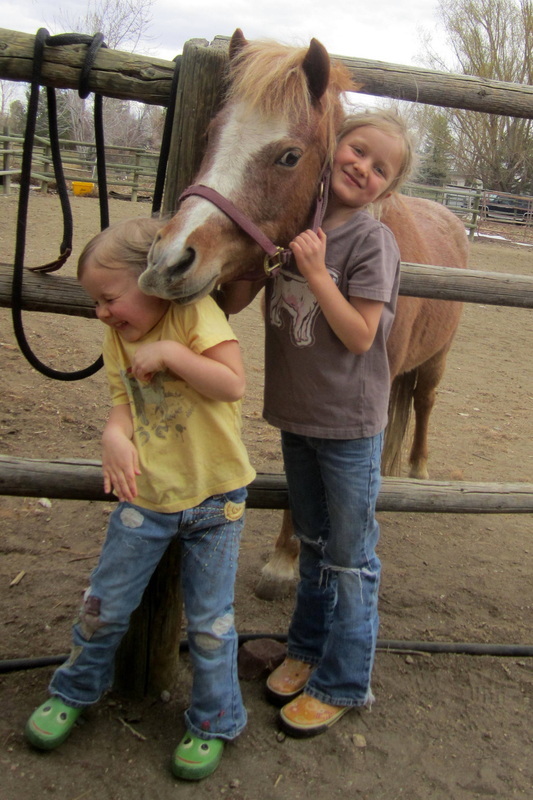 Pony Camp is a fun way for younger children to spend time on the farm and get lots of time with our horses and ponies. In addition to joining in on a full round of farm chores feeding chickens, pigs, milking goats and playing in the hay barn, we'll spend LOTS of time with the horses, grooming, leading, saddling, learning about parts of the horse and then learning the basics of riding. And if it gets too hot, we'll just declare it time for horse baths! Please send your child with water, lunch, a snack, boots, and long pants. 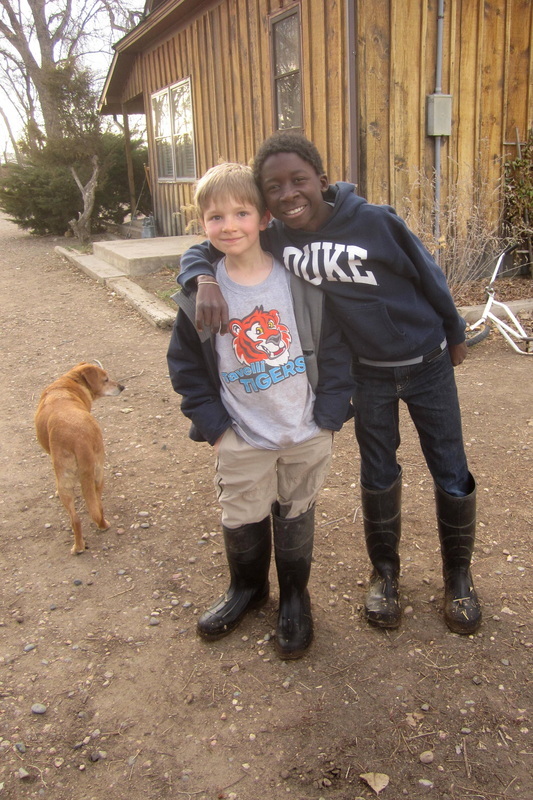 Children need boots or sturdy shoes that cover the toes when working with horses. Playing with horses is fun, but they require lots of work to take care of. Kids will get to experience a day working at the barn. We'll clean stalls, feed horses, polish tack, and clean grooming tools. If time allows we will also do pony rides. Please send your child with a snack, boots, and long pants. Have you ever wanted to learn about the differences between English and Western riding? Here’s your chance to try both and learn a lot along the way. We’ll learn the tack of both disciplines and also get a chance to ride with both styles. We will also experience a variety of aspects of life on the farm with haybarn fun,nature exploration and play. Please send your child with water, lunch and a snack. Children need sturdy shoes that cover the toes when working with horses. On Summer Farm Days we will explore the new children’s garden, play in the haybarn, learn about horses, chase chickens, brush the pig, milk the goat, and get a sense of what life is like on the farm. We could also also have hands on nature activities and / or water fun depending on the day. Please send your child with water, lunch and a snack. Children need sturdy shoes that cover the toes when working with horses. This camp is for older riders with limited or no riding experience. 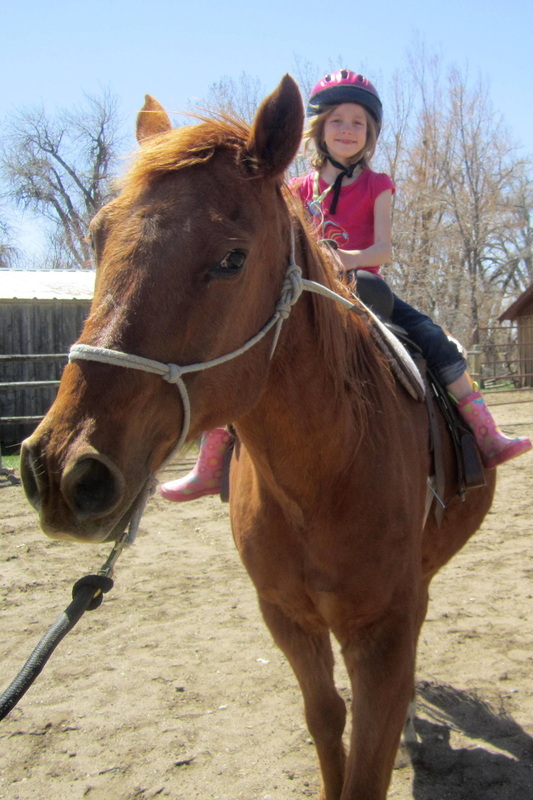 We'll practice safety on the ground, play leading games, groom, and work on basic riding skills. If time allows we will learn the different parts of our saddles and bridles, learn about different breeds of horses, and learn about horse colors. During lunch the riders will get homework handouts that need to be completed and turned in the following day. Please send your child with a lunch, boots, and long pants. We will have our hands in the garden, learning about soil and all the good bugs valued to our garden and plants as well as the usual farm chores, nature exploring and haybarn fun. Playing with horses is fun, but they require lots of work to take care of. Kids will get to experience a day working at the barn. We'll clean stalls, feed horses, polish tack, and clean grooming tools. If time allows we will also do pony rides. Please send your child with a water bottle, snack, boots, and long pants. In addition to joining in on a full round of farm chores feeding chickens, pigs, milking goats and playing in the hay barn, we’ll be riding horses, making an adventure course in the arena, and playing water games in the orchard. Pony Camp is a fun way for younger children to spend time on the farm and focus on our horses and ponies. In addition to joining in on a full round of farm chores feeding chickens, pigs, milking goats and playing in the hay barn, we'll spend LOTS of time with the horses, grooming, leading, saddling, and some basics of riding. And if it gets too hot, we'll just declare it time for horse baths! We will provide a healthy snack and you will pack a lunch for your cowboy / cowgirl. We will have lots of grooming and leading like below, but we've expanded the horse activities so that there will be riding and some other horse fun also! We will see if it works to do a horse show. This is a two day class plus short halter show that is best for kids with some leading and grooming experience. Our first day we will spend setting up our obstacle course and learning how to safely and properly lead our horses through the course. The pattern will need to be memorized, so we will spend lots of time on this! The second day of class will be spent washing, grooming, and braiding our horses so they look their best for the show! The last half hour of class on Thursday will be dedicated to a halter show, which parents and family members are encouraged to attend. . Please send your child with a water bottle and snack each day, as well as long pants and boots to protect their feet around the horses. We'll be taking commemorative photos on show day, so you may want to send kids with nice change of clothes: Jeans or breeches, boots, and a button down shirt. On Summer Farm Days we will explore the new children’s garden, play in the haybarn, learn about horses, chase chickens, brush the pigs, milk the goat, and get a sense of what life is like on the farm. For this class we will be exploring different smells, and tastes in the garden, making herb tea, working with the bees, sampling honey. This camp is for older riders with limited or no riding experience. We'll practice safety on the ground, play leading games, groom, and work on basic riding skills. If time allows we will learn the different parts of our saddles and bridles, learn about different breeds of horses, and learn about horse colors. During lunch the riders will get homework handouts that need to be completed and turned in the following day. Please send your child with a water bottle, lunch, boots, and long pants.